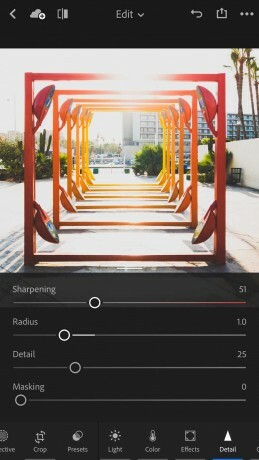 Adobe today updated its Lightroom Mobile application for Android and iOS devices. Adobe says it overhauled the Android version from the ground up to give it a more native Android feel. Every screen has a new design that Adobe claims is faster and more efficient to use. The iOS version of Lightroom Mobile received several new features in this update. First, Lightroom for iOS now includes a selective brush tool to selectively pain enhancements into any part of an image. iOS devices that support 3D Touch can use the pressure-sentive screen to apply varied effects through the selective brush. The same functionality is available to the iPad Pro when used with the Apple Pencil. Lightroom Mobile for iOS also gains the ability to selectively erase both linear and radial gradients, and the refreshed details tab allows people to control sharpness and noise reduction over the entire image. Last, Adobe says the iPad version of Lightroom Mobile now takes better advantage of the tablet's screen real estate to make more controls accessible. Lightroom Mobile is free to download from the Google Play Store and the iTunes App Store. Adobe today made its mobile photo editing apps far more powerful. Fresh updates to Lightroom for Android, Photoshop Express for iOS, and Lightroom on the web give mobile device users a richer array of tools for manipulating photos on the go.